The following are mini-reviews of books I read in 2011. The good news: Dr. Lloyd makes a valiant attempt at explaining quantum mechanics. The bad news: Dr. Lloyd makes a valiant attempt at explaining quantum mechanics. Prior understanding of quantum mechanics would help prospective readers of this book. As I said, Dr. Lloyd attempts to explain it, but my eyes, at least, tended to glaze over at times - many times in fact. A minor but interesting tidbit I got from the book and that I hadn't considered before was that the actual universe is much larger than the currently visible universe; i.e., the universe has continued expanding during the time it took for the light from the most distant objects we see to reach us. To really blow your mind, read Wikipedia's entry on the observable universe. I read this a few months ago, so I'm trying to reconstruct some of this mystery/romance/supernatural story from memory. Set in the late 1800s, the story concerns one Cyril Forrester, son of a late famed Egyptologist. Pharos, an ancient Egyptian magician who has managed to keep himself alive down through the centuries, tries to steal a needed mummy from Forrester. Somehow, they both end up traveling to Egypt on the same boat and, on the return trip, Forrester unwittingly becomes the carrier of a plague that Pharos hopes will wipe out Europe. Oops! One detail I left out: Pharos has a lady, Valerie, in his power and with whom Forrester falls in love. A good pulp fiction story with bits of Egyptmania thrown in. The big question I came away with from the book was why, with Pharos cowering in a corner of the boat in the middle of a violent storm and knowing how evil he was, Forrester didn't simply throw him overboard? A good mystery story with a detestable victim and a likeable detective. From Linda Otto's comment on the book: "It is one of the few mysteries I have read that you are completely on the side of the murderer. If ever anyone required a good murdering, it was Simon Varr." Also see Mike Gray's "Livingston, I Presume?" After being unable to put down Mlodinow's The Drunkard's Walk the previous year, my high expectations for Euclid's Window started to crumble midway through the book, largely the result of my own inability to understand the more advanced fields under discussion. The 1800s and the laying of the geometric foundations for Einstein's theories of relativity were very rough going. I had thoroughly enjoyed Janvier's In the Sargasso Sea , so I had high hopes for The Aztec Treasure-House . In a storyline similar to that of G. A. Henty's The Treasure of the Incas , a group sets out in search of a lost Aztec city. Although Janvier is certainly the better writer, this book didn't live up to my expectations. Back in 2005, I happened upon Reformation in a local university bookstore. I wanted to read it, but the price was a little steep, so I grabbed Garry Wills' Why I Am a Catholic from the bargain bookshelf instead. Not a bad trade-off, but, six years later, I finally got to read Reformation . Diarmid MacCulloch is a great writer and the Reformation is a worthwhile subject, but I couldn't make it past the page 360s of this 800+-page book. And the reason why can be found in the fascinating introductory section of the book, where MacCulloch presents an overview of the world immediately prior to the appearance of Martin Luther's 95 Theses on the Power and Efficacy of Indulgences in 1517. At that time, there were no countries or nation-states as we think of them today. Instead, regions of land were typically owned and ruled by powerful families, except in the case of independent townships such as Geneva (which was not part of Switzerland). Consequently, as MacCulloch pours out his encyclopedic knowledge of the Reformation on the reader, he willy-nilly jumps from this place to that with only a paragraph break between the two. Presenting a chronological history of what was not a monolithic revolution in thought results in a scatter-shot approach to the subject; combine this with text that is densely packed with information and you get a difficult-to-follow narrative. This book was a page-turner for me - a brief, but fascinating, overview of astrobiology (Wikipedia): the search for and study of life on other planets, both in our solar system and in other stellar systems and galaxies. Dartnell examines the current state of the various scientific fields that fall under the umbrella of astrobiology and looks at alternative ways in which life might develop (i.e., other than the DNA/RNA basis of terrestrial life). The Astrobiology Web - "Your Online Guide to the Living Universe". This is a science-fiction retelling of The Book of Job , in which the Job stand-in has a singular affliction: being transported frequently and without warning to alternate universes. A fairly interesting book. I looked forward to reading this book - the title and subject matter were enticing. Despite the author's infectious passion for William Smith's story and geology, I found the book kind of boring - a lot of names of geological eras were thrown around, but not much geology emerged. I had to read some ways into the book in order to get a glimmer of what Smith was famous for, so I finally resorted to the Internet to get a run-down on his story and impact (see the links below). I read about 150 pages of the book; I don't know if I'll be able to manage the rest of it. I do commend Winchester's admiration of Smith. Many years ago, I checked a book out of the library, an autobiography of a geology professor. The professor was of the type that denigrated his forerunners in the field for their mistakes, as if it was somehow their fault that they didn't have the knowledge and science of the twentieth century behind them. I much prefer the late Stephen Jay Gould's approach to the history of science: scientists were trying to grasp, make sense of, and acquire knowledge of the world. If they sometimes came up with the wrong conclusions or answers, so be it - at least they were trying. NASA's feature article on William Smith and the principle of faunal/fossil succession - on which the field of biostratigraphy (Wikipedia) is based - and a related article showing the map. The Geological Society of London's Geoscientist article, "Smith's other debt", which details Smith's knowledge of John Strachey's earlier mapping of strata in the same coalfield that Smith surveyed as a young man. I found these links by Google'ing "William Smith geology", but you'll also find these and other links on Smith's Wikipedia page. A small collection of quirky - and mostly forgettable - short stories. Plates, terranes, and geologic auto tours. Well, all except for the last. Written by a retired geology professor and published in 2002, this book is exactly what the title says: a brisk, 200-page biography of Planet Earth, beginning shortly before the formation of the solar system (a nearby supernova is believed to have been the source of the heavier elements we find in the solar system) and continuing on up through today. As a one-time would-be astronomer, I was naturally caught up in how the solar system was formed. What really tickled my fancy, though, was Dr. Meissner's discussion of radiometric dating. Knowing the ratio of an unstable radioactive element in a rock to its decay product allows us to determine when the rock was formed. But, beyond that, if we check for the radioactive element with the highest melting point and then check for radioactive elements with successively lower melting points, we can determine both the original age of the rock and the dates at which it subsequently metamorphosized (if it did). This technique is just a small part of the whole story, occupying a single paragraph, but, for some inexplicable reason, I found it fascinating. And then Dr. Meissner dives into seismology and plate tectonics ... I'm in seventh heaven! I dropped out of college in my sophomore year and immediately developed an insatiable desire to read. (Fortunately, I went to work in the University of Maryland library system; I was exposed to a wide variety of books and I read a wide variety of books before returning to college a few years later.) The very first book I read was Continents in Motion (1st edition, 1974) by Walter Sullivan (Wikipedia), a very popular science writer at that time. Dr. Meissner makes the subjects equally intriguing. The book finishes up with a look at the beginning and evolution of life on the planet and a final chapter on present-day resource consumption and global warming, all regrettably brief. Also see this book review, which includes a little background information on Dr. Meissner. Glucocorticoids. Remember that word, practice pronouncing it, and memorize its spelling - it appears more often in this book than the articles "the" and "a". The tone of the book is more conversational and breezy than Sapolsky's other books, which is bit off-putting considering the seriousness of the topic. And this book is serious - the first half of the book describes the effects of long-term stress responses on the body and reminded me of Dr. Sherwin Nuland's deeply troubling How We Die book, but with humor and pop-culture references (that won't wear well in the long run) thrown in. Whereas the first half of the book covers the physical effects of stress, the second half addresses psychological stressors: the different kinds of psychological stress, their sources, their prognoses, who is likely to suffer from them, and, at the end of the book, how to cope with them. For example, one chapter is devoted to depression, "projected to be the second leading cause of medical disability on earth" by the year 2020; watch the video below. In addition to cases involving humans, many of the studies discussed are based on observing non-human primates inside and outside the laboratory and on experiments with mice and rats. The case studies often reveal counterintuitive results. All in all, I would place Why Zebras Don't Get Ulcers in the top N books I've read, not only because Dr. Sapolsky is an excellent writer, but because of the importance of the subject to the health and well-being of the human population. Stress: Portrait of a Killer , a joint production by Stanford University and National Geographic Television of a documentary based on Why Zebras Don't Get Ulcers . Hillary Blakeley's blog post, Science and Art, on how the book cover is a spoof of a Matisse painting, The Dance (Wikipedia). Robert Sapolsky on Depression in the U.S. (YouTube video) - is a 50-minute lecture by Dr. Sapolsky on the debilitating effects of depression and stress. A fascinating lecture that is well worth watching. This tiny book, before it was even published, set off a display of fireworks worthy of the 4th of July. The most damning epithet of all, "Universalist" (one who believes in the salvation of both Christians and non-Christians), was hurled at Rob Bell. If nothing else, the controversy made for interesting discussions on religious blogs. Love Wins is an inpirational book about God's love for all He has created. He is not a God who condemns people, Christian and non-Christian alike, to unending torture in Hell. In the examples Rob Bell gives from the New Testament of people being "handed over" to Satan, it is not for eternal punishment, but to make them right with God, thus ultimately saving them. As a book, Love Wins seemed to me to be written at the Young Adult level, perhaps to appeal to a wider audience since its purpose is to inspire. Given the controversy the book engendered, I had expected a "meatier" text. The book is oddly layed out, using formatting to emphasize ideas, parallel ideas, and opposing ideas. The technique works, but it makes for strange reading. Don Miller's most excellent book review, posted April 1, 2011. "Should I not be concerned? ", one in a series of posts about Team Hell by Fred Clark at the slacktivist blog. — Patty Griffin, "Love Throw A Line"
A dramatic change of pace, from Rob Bell's light, inspirational tract on salvation to Bart Ehrman's dark book about theodicy, the study of why an all-powerful, loving God allows evil in the world. In a way, both books address the same subject, Bell's on the question of evil in the afterlife and Ehrman's on evil in life. Dr. Ehrman was a devout Christian beginning early in his life. Reared in Kansas as an Episcopalian, he had a born-again experience in high school. He attended Moody Bible Institute and then completed his undergraduate work at Wheaton College. He continued his studies at the Princeton Theological Seminary, where he received a Master of Divinity degree and a Ph.D. in New Testament studies. During this time, Ehrman remained active in churches of different, mostly evangelical denominations. After many years of internal turmoil over the existence of suffering, all the while still participating in the religious community, he finally became agnostic. Out of sight, out of mind. For the average American (and non-American too), the horrors of life on Earth for too many people do not often come to mind: the savagery of war, genocide, oppresion, starvation, malnutrition, disease, etc. Dr. Ehrman recounts examples of these horrors and, despite counting his blessings, he finds them deeply disturbing (as we should too). His focus in the book is not on theodicy in general philosophical terms, but on the explanations for suffering found in the Old and New Testaments. These explanations are usually variations on (i) God is punishing people for their sins or (ii) God is testing people's faith. The New Testament, with its emphasis on the afterlife, adds the promise of a reversal of fortune after one dies. Dr. Ehrman gives short shrift to those who consider evil the price of "free will" - is the supposed "blessing" of free will absent in heaven, where there is no evil? The coverage of the Bible's explanations for suffering is excellent and, not surprisingly, the explanations don't come close to answering an unanswerable question. As a final note, Ehrman several times uses the simple but poignant example of saying grace before a meal, ironically thanking God for giving us food while millions are starving. A humorous and gross horror story about a man who survives a plane crash and is stranded on a desert island. "Wilson" is an obvious reference to Tom Hanks's volleyball companion in the movie, Cast Away , but this man's companion is not a volleyball, but a fellow "survivor" who ate some poisoned berries and turned into a zombie. Somewhere in between fending off her attacks on him and trying to survive on what little food he can scrounge up, he becomes attached to her. Also see the the book's web site, with excerpts from Book 2 of the Diaries . The heart of the book, the next 7 chapters, explores various themes in the Qur'an: water, marriage and divorce, war and peace, tolerance, life and the afterlife, paradise, and the divine and human faces. Comparisons and contrasts with the Old and New Testaments throughout these chapters are fair enough; Christian practices are drawn largely from the Anglican Church, probably because Dr. Abdel-Haleem lives in England. I do find that the author, a devout Muslim, is stretching a bit too far in some cases to justify particular Qur'anic practices. For example, Allah gives more of something and less of something else to each person. Thus, in marriage, the husband and wife have roles of equal weight, just different: the husband rules the wife, but the wife rules the children, so it all balances out in the end. (I'm simplifying Dr. Abdel-Haleem's arguments.) With respect to divorce, the husband can divorce his wife simply by pronouncement, three times with waiting periods between each pronouncement in case of reconciliation. The author tries to say the wife has a similar right to divorce by citing Egyptian practice, in which the wife must take the case to court, renounce any financial obligations due her, and pay back her dowry - and hope the court rules in her favor. To me, the burden on a wife seeking divorce is so much greater that it may well be impossible to get a divorce; e.g., how do you pay back a dowry if you have no independent means? Tolerance for other religions and cultures is - or should be - a well-known trait of Islam. (As with other religions, this is sometimes truer in theory than in practice. This week, a Saudi royal decree possibly opens the door for women to eventually participate in politics and, in Iran, a Muslim-turned-Christian was sentenced to death for apostasy.) Tolerance doesn't extend to "modern" "alternative life styles" that run counter to the Qur'an's teachings. Regarding the afterlife, there is apparently no possibility of redemption for those condemned to Hell (see Rob Bell's Love Wins above which posits a different view). Despite my misgivings about some of the arguments, after reading the first 9 chapters (introduction, al-Fātiḥa, and the 7 themes), I came away with, I think, a better understanding of the Qur'an. I believe Dr. Abdel-Haleem accomplished his purpose for this non-Muslim reader. Following his coverage of themes, Dr. Abdel-Haleem next examines in detail the different approaches taken by the Qur'an and the Old Testament to the story of Adam and Eve (Genesis) and the story of Joseph (Genesis). I skimmed over the final two chapters of the book, which discuss writing style in the Qur'an and would be of most interest to someone planning on performing textual analysis of the Qur'an. The penultimate chapter devotes itself to context and internal relationships (intertextuality in modern parlance!). The former basically concerns the idea that a phrase or verse can only be understood in context; the latter pertains to the fact that a subject may be mentioned in one verse and be elaborated upon or referenced in other verses, possibly in other sūras. The last chapter focuses on iltifāt (changes from one form to another), the primary type found in the Qur'an being switching between the use of first person ("I" and "We"), second person ("You", singular and plural), and third person ("He/She" and "They"). For example, the person in which Allah or the Prophet is referred to may change between verses or even in the midst of a single verse. Also see the Online Quran Project, at which can be found translations of the Qur'an into various languages. Wow! With the book's unassuming title, I was expecting a staid overview of astronomy updated with the latest research results. What I got instead blew me away. Gater, a well-known, British, popular astronomy writer, offers up a detailed look at recent (as of 2009) spacecraft missions and advances in ground-based observation, all written in a style that made me loathe to take breaks from reading the book. Gater next moves further out in the solar system and, from there, out into deep space. For the latter, he has to depend on orbiting telescopes and ground-based observations. Every topic he covers is fascinating and, as I said before, is tremendously well-written. Let me say "Wow!" again. This quick read is all about brain teasers used in hiring interviews, most famously at Microsoft, but spreading to other companies, particularly on Wall Street. Since I'm not someone who necessarily thinks quickly on his feet in a high-stress situation like a job interview, I'm not a fan of puzzles used in this fashion or of programming tests; I prefer to be judged by my experience and by samples of my work. (Poundstone points out that fresh college graduates, who don't have experience and examples of work yet, like puzzle interviews.) I also don't buy the idea that Microsoft's employees are all the best and brightest. Individuals, yes, but, in an organization as large as Microsoft, I figure they have the same distribution of coding talent as any other company. Poundstone follows up with a short biography of Bill Gates and his upbringing in a game- and puzzle-obsessed family, the use of puzzles in Microsoft interviews, and the gradual embrace by Wall Street and other firms of puzzle interviews. Example interview puzzles are scattered throughout the text, as well as quotes from present and former Microsoft employees. The last two chapters give tips to the interviewee on preparing for a puzzle interview and tips to the interviewer on the appropriate use of puzzles in the hiring process. Finally, an appendix gives the answers to all of the puzzles posed in the text. I was glad to see one of the interview questions: "Why does a mirror reverse right and left instead of up and down?" My philosophy professor, who assigned the paper (I chose the topic), asked this of our class and never gave us the answer. The example he gave was of holding up a newspaper to the mirror, but you can't read it because the text is reversed right to left. The answer is that the mirror doesn't reverse right and left, it reflects in and out - you're the one who reversed the newspaper right to left (by flipping it around to face the mirror) and thus made it unreadable. An insoluble problem - to me - for oh so many years now solved! Two observations: particularly telling is that (i) Bill Gates himself - the big proponent of on-the-spot puzzle solving - was flummoxed by aggressive questioning at a 1998 press conference (page 121) and (ii) some of the Wall Street firms mentioned as having adopted puzzle interviews (chapter 6) are the same companies that brought the U.S. economy to its knees in 2008 and had to be bailed out by the U.S. government. Perhaps the Wall Street companies should have focused less on a potential employee's ability to come up with tricky financial scams and more on character and ethics - although perhaps the latter wasn't in the companies' bottom-line interests. Written in Stone begins with a history of evolutionary theory up through Darwin's time and then examines particular aspects of evolution and what the fossil record shows. (William Smith is even mentioned.) For example, Switek explores the emergence of animals on land from the sea, dinosaurs and the evolution of birds, whales, horses, and primates. Regarding whales, it had never occurred to me that they were mammals returning to the sea; Darwin, in the first edition of The Origin of Species , had even speculated that whales evolved from bears, some of which swim in the water with their mouths open to catch whatever food they can. The chapter on horses echoes an essay by Stephen Jay Gould I once read. As Gould pointed out, and now Switek, horses are the paradigmatic example of evolution in textbooks, illustrated with a linear descendence from the first horse ancestor. In reality, the evolution of horses was a bushy shrub with present-day horses the only surviving species, most of the other species having gone extinct. Primates are of prime importance to us (pun intended), but, even here, things can get confusing. Switek reports that we are hominins, but also hominids and hominoids - remember to keep these straight in your mind! What really fascinated me about this book, and what Switek conveys really well, is that the 200-plus-year-old field of paleontology is still very active and dynamic, with many issues being resolved only in recent years and many other issues still open. One little tidbit, for example, is that velociraptors were probably covered in feathers, found out a little too late for the Jurassic Park movie. Oh, and I mustn't forget to mention the extraordinary luck of fortuitous accidents putting paleontogists back on the right path; in particular, there were two cases of supposed reptile fossils whose skulls slipped out of the examiners' hands, broke, and revealed mammalian inner-ear bones. All in all, a very satisfying read and, upon finishing, I felt that I had learned a lot. Lynne Truss's rallying cry: "Sticklers unite! You have nothing to lose but your sense of proportion (and arguably you didn't have a lot of that to begin with)." Eats, Shoots & Leaves is a short humorous book on British punctuation (with occasional references to the differences between British and American punctuation). Against all expectations, it became a best-seller. The title of the book is based on a joke about a panda bear who eats a meal in a restaurant, shoots the waiter (or whomever, depending on the version of the joke), and leaves. When asked why, the panda bear hands over a wildlife manual with the poorly punctuated definition of what pandas eat. The book is hilariously funny and informative at the same time, with lots of tidbits of history thrown into the mix. My only complaint is that the book, despite being so brief, is very verbose; the amount of humor is almost overwhelming and, at times, wears a little thin. I'm a proponent of Oxford commas, by the way. 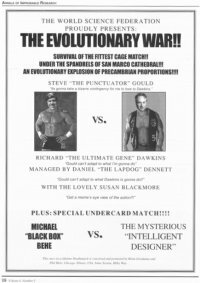 Richard Dawkins and Stephen Jay Gould had a bitter, long-running feud. 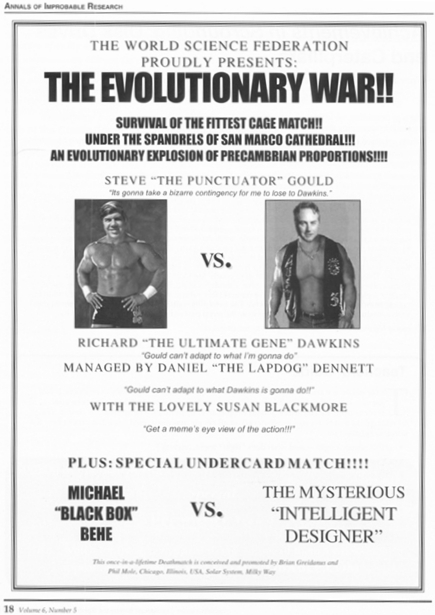 From this book, I gather the feud had something to do with Dawkins thinking the gene was the unit of natural selection and Gould thinking selection took place at higher, varying levels. (I've only read one book by Dawkins many years ago and a goodly number of Gould's books.) They had other differences and also a lot in common. The final chapter in the book summarizes the two's disagreements and is followed by a useful chapter-by-chapter list of recommended readings. Also see the book's Wikipedia entry. Maybe something is Nothing or Just something. For real! This book is a cute, humorous, and informative introduction to Haskell, a functional programming language that has been around for a while, but has recently become a big fad in functional programming. Sections in the book have humorous titles replete with cute illustrations (e.g., the section on let blocks is titled "Let it be" and is accompanied by a cartoon of George Harrison!) The book is available for purchase or to be read on-line for free at Learn You a Haskell. I'm reading Learn You a Haskell without doing any actual programming in Haskell. I'm doing this because (i) I wanted to learn a little about Haskell after reading a paper from the Johns Hopkins University Applied Physics Laboratory about compiling Haskell into instructions for a FORTH-oriented CPU and (ii) I wanted to learn about monads. Reading a programming book without programming is a little intense, so I alternate between reading Learn You a Haskell and some of the books that follow in this list. Chapter 9 manages to cover input and output without delving specifically into monads, the discussion of which is postponed to Chapter 12. Once you manged [sic] to grok the basic stuff about Typeclasses, Functors, Applicative, Monads, Monad Transformers, different notions of recursion, a minimal understanding of how lazyness [sic] can be quite tricky, the multitude of different ways of how errors and exceptions are handled in various libraries, and perhaps basic STM [Software Transactional Memory], Haskell has a tendency to become even more complex. Also see this discussion, "Is Haskell the Cure?". It has arguments both for and against Haskell; many of the arguments against Haskell reflect my own impressions from reading this book: give me the simplicity of Scheme. For a writer of his stature, Lovecraft had a surpisingly difficult time getting this novella published because of its length. Finally serialized in 1936, it is an odd but effective piece of writing in that the bulk of the action takes place at the very beginning of the book. A research group travels to Antarctica and uncovers the frozen bodies of alien creatures which, unbeknownst to them, are in a state of hibernation. The barely warm Antarctic sun awakens them, with predictable results. The remainder of the story follows two scientists as they explore the creepy ruins of the ancient, alien civilization. Exploring, ruins, dead civilization - sounds boring, right? It's not! Although reminiscent of Leonard Mlodinow's The Drunkard's Walk , The Jungles of Randomness kind of seemed to follow a random walk of its own, not adhering to a discernible (to me) theme or progression throughout the book. It makes up for this by touching on a much wider variety of topics in randomness and probability than Mlodinow's masterpiece did. One interesting tidbit among many is that flipping an actual U.S. penny and catching it gives you a 50/50 chance of it coming up heads, but spinning the coin only gives you a 30/70 chance of it coming up heads (because of the physical differences between the head and tail of the coin). The chapter on drums particularly drew my interest. A plucked string has overtones that are integral multiples of the base frequency. Not so drums. A circular drum has overtones that are 1.594 multiples of the base frequency; non-circular drums have overtones at other multiples. In the 1960s, a cottage industry arose after a mathematician asked if you could determine the shape of a drum from its acoustic spectrum. 30 years later, a husband-wife team, with the help of a third mathematician, determined that drums of two different shapes could produce the same acoustic spectrum. (To simplify the math, drums shapes were polygons with right angles and straight sides.) This finding has importance beyond beating a drum. In any field involving the deduction of hidden properties from spectra (e.g., seismic waves in geology or scanning the human body), is it possible that two or more instances of a hidden property could produce that same spectrum? If so, which instance is the correct one being observed? At some point, I realized the book had moved into the field of chaos theory and I had somehow missed the distinction made between chaos and randomness. Figure 2 of "What is Chaos?" provides a useful table of differences between order, chaos, and randomness. Lesson for me: pay closer attention to what I'm reading. Clocking in at about 110 pages including the index, this collection of brief essays, written for the World of Viruses project, takes you on a whirlwind tour of viruses. The book begins with a history of the gradual discovery of viruses and then examines various types of viruses. Particularly interesting were the essays on the extraordinarly large world (and I don't mean in a spatial sense) of marine viruses and on combating viruses with other viruses. Also see Zimmer's science blog, Matter. "Biologists, with some justification, argue that the life sciences are fundamentally harder than the physical sciences." Throwing math into the mix certainly doesn't make biology any easier and, despite the book being written for the layman, I felt like I was in way over my head at times. The purpose of The Mathematics of Life is to show how both biology and math borrow from and contribute to each other; aside from the inscrutable science, Ian Stewart achieves this admirably. One chapter early on that I did understand was the application of Fibonacci numbers (the sum of two succesive terms gives the next term) to the growing of leaves around the stem of a plant and the number of petals in the plant. It turns out that if you make a fraction of succeeding terms in a Fibonacci sequence (i.e., term n divided by term n+1), the fraction approaches the value of 2 - the golden ratio as you move down the sequence. Anyway, this controls the placement of leaves and the number of petals are usually a Fibonacci number. Not all plants follow the Fibonacci sequence; some follow the similar Lucas series of numbers. The other chapters, as I mentioned above, show how the biology and math fields are driving each other forward. Although I couldn't always comprehend the details, the broad-ranging topics are fascinating in their own right and I came away from the book with lots of interesting things to ponder. American readers take note. In a chapter on viruses, Stewart frequently refers to footballs in relation to icosahedrons and how both approximate the shape of a sphere, the football more fully when inflated. In America, a football is an oblong object with pointed ends; it finally hit me that Stewart, an Englishman, was talking about soccer balls! In college, I took a "Psychology of Language" class and realized too late that what I really had wanted to take was a linguistics class. Here's an attempt to make up for what I missed. This is a textbook. I knew that before I started reading it; it's a relatively short textbook and it sounded interesting, so I dove into it anyway. Textbooks should only be read if you are taking a class. While reading the book, I constantly felt like I was studying for a test. It was not a comfortable feeling! I tried reading one of Noam Chomsky's books way back when, without much success. I was hoping for a gentle introduction to his theories, but that was not to be. In Chapter 1, Chomsky's theories are mentioned as part of the competence-based approach to linguistics, as opposed to the performance-based approach, a functional, more holistic approach. Dr. Meyer takes the latter approach. Consequently, much of the material dealing with the social and psychological aspects of linguistics brought back vague memories from my psychology class. The most interesting parts of the book for me were the sections on the history of the English language, the reconstruction of protolanguages, how languages change, and, lastly, semantics and dictionaries. Chapters 5 and 7 on syntax and phonology, respectively, were the most difficult chapters: densely packed with information and terms to be memorized by the hapless student; hopefully, a professor using this text will have well-organized, bulleted, PowerPoint presentations for his class on these subjects. (Incidentally, the word "hopefully", frowned upon by English pedants, makes an appearance in the book as an example word.) One of the book's claims to fame is that it uses real-world examples of sentences and paragraphs, complete with citations of the corpora (Wikipedia) from which they were drawn. The book had more of an impact on me than I expected. The day after I finished reading it, I was standing in line at the pharmacy and noticed two bins marked "Later" and "Waiter" ... and I got to thinking about what I had learned in the book. This book is an attempt to place James Hutton, the father of geology, on a pedestal alongside Copernicus, Galileo, and Darwin for divesting science of its religious baggage. The book, while well-written and certainly interesting, is not entirely successful in that regard. Hutton did not leave volumes of correspondence by which his life could be reconstructed, so the author largely relies on John Playfair's popularization of Hutton's work and, to fill out the book, covers a great deal of Scottish history in the 1700s, throwing in everything from Bonny Prince Charlie to the more relevant Scottish Enlightenment. As other reviewers have noted, there is precious little actual geology in the book. Hutton's contribution to geology was the concept of uniformitarianism, the idea that the same geologic processes active today were active in the past; this, in turn, implied an Earth older than the widely accepted and religiously acceptable age of 6,000 years at the time. Hutton did not venture a guess as to how old the Earth actually was, the most precise determination of which would not take place until 150 years later in the 1950s: 4.6 billion years. The Devil, reflecting on the fact that, when the Apocalypse occurs, it is preordained that he will lose, decides to quit the business altogether, leave the underworld, and settle down on Earth as a human. Aside from occasional anger management issues, things are going swimmingly for the ice-cream- and Lamborghini-infatuated Devil - until he realizes that the End Times have begun without him! The book is a hoot! The story-telling is hilarious, the story is action-packed, and the plot takes unexpected turns. Other readers are comparing Anthony Miller to Douglas Adams, but I think that's unfair to Miller - both authors are/were brilliant in their own right. It's been several decades since I've read any Lord Peter Wimsey stories, long enough to forget the plot of this book I've read before. Wimsey is in top form in this somewhat long-winded story: a cantankerous painter is murdered in an art community in Scotland and Wimsey is called upon (or calls upon himself) to solve the crime. Don't wait a year to write a book review! This epic and influential book, written by a professor of biogeography, is a geography buff's dream come true. Diamond explores the rise and spread of civilization, leading to an examination of why Europe came to dominate the world in so many ways. The answer, no surprise, is geography. The east-west axis of Europe, North Africa, the Middle East, India, China, and Japan imposed no major geographic or climatic obstacles to the spread of agriculture, technology, and civilization from their origins in the Middle East. The north-south axes of Africa and North and South America, however, resulted in varying physical and climatic regions that inhibited the spread of these same things. This book was a good follow-on to Guns, Germs, and Steel . Where Jared Diamond covers the spread of agriculture and technology, Janson covers the spread of languages. And there is much common material between the two books. (Diamond's mother was a linguist and he does talk about the spread of languages in his book, but not in the same detail as Janson.) I found Speak to be fascinating reading, with one slight jarring note: the author speaks - no pun intended - of "gatherers and hunters" rather than the more conventional "hunters" and gatherers". Just a minor complaint. Collapse , Jared Diamond's sequel to Guns, Germs, and Steel , looked to be a formidable, nearly 600-page read, so I opted for the lighter Nicholas Nickleby . Part way into the story, I noticed that Dickens's novel was actually longer than Collapse ! However, Nicholas Nickleby was a smooth read, a good story, and well worth my while. At the insistence of his wife, Mr. Nickleby invests his family's money and loses everything, including their home. The shock of instant destitution kills him. His widow and their two children, Nicholas and Kate, move to London and temporarily take a cheap apartment - they can't afford a more permanent residence. The family appeals for help to the father's brother, Ralph Nickleby, who is kind of like Scrooge, but even worse - an evil Scrooge. Nicholas and his uncle, who is not inclined to help anyway, take an immediate dislike to each other. Thereafter, Ralph throws misfortune Nicholas's way every chance he can and, to a lesser extent, likewise to Kate. Nicholas Nickleby joins other Dickens novels in exposing the seamier side of life. Although written before George Eliot's time, the book has many George Eliot-style quotable quotes; perhaps she was influenced by Dickens. This book is about the 50-year-old project that was originally called Project Ozma (Wikipedia), but which eventually evolved into the Search for Extraterrestrial Intelligence (SETI). First off, Davies makes a mistake that he repeats twice, saying that Project Ozma was named after the Land of Oz. As any lover of the Oz books can tell you, Ozma was Princess Ozma, the rightful ruler of the Land of Oz. When she was young, she was turned into a boy, Tip, and raised by an evil witch. After various adventures with Jack Pumpkinhead, the Sawhorse, and the highly magnified Woggle Bug, Tip is turned back into the beautiful princess, who assumes her throne and becomes a generous and compassionate leader to her people. A substantial portion of the book is devoted to exploring new approaches to SETI, since the old approach, listening for alien radio signals, has produced no results in 50 years. While interesting at first, the text gets a little tedious after a while as the author proposes one approach after another and shoots each one down. For example, aliens or alien probes may have left messages encoded in DNA sometime in the past. However, how would possibly-non-DNA-based aliens know beforehand that the Earth has DNA-based life and, even so, would we recognize the messages in a DNA sequence?